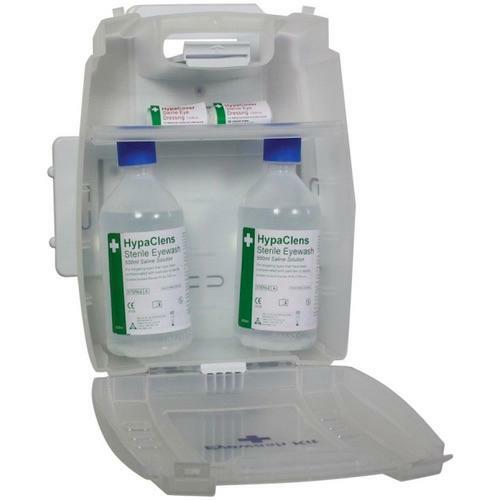 Evolution Plus 2x500ml Eyewash Kit is our best selling eyewash kit and is supply stocked with 2 HypaClens Sterile Eyewash Bottles, 500ml and 2 HypaCover Sterile Eye Dressings. Evolution Plus 2x500ml Eyewash Kit is supplied in a durable hinged case that includes bottle stabilisers to hold contents firmly in place. The kit includes a quick release wall fixing bracket and kit identification label to provide a better storage and an easier identification. Once on the bracket, the kit can be opened and worked with, providing a self-supporting workbench. Evolution Plus 2x500ml Eyewash Kit assures you have adequate eye wash facilities at your place of work. The Evolution Plus 2x500ml Eyewash Kits are available with or without mirror. The mirror provides easy application of Eyewash.